Easycooking: Appam ~ A not-so-traditional recipe!! Warning – This is not the traditional recipe for Appam. Appam,known by many names-Palappam,Vellayapam,Aappam is a fluffy rice pancake made originally with kallu[toddy] which gives it the unique sweet and sour taste.It is a quite popular breakfast item in Kerala and a rockstar during Christian wedding feasts and festivals.Paired with Stew[mostly mutton] it has a very homely tag attached to it. Most recipes use yeast for the fermentation of the Appam batter.Long back,my amma tried to recreate this recipe from Vanitha and had to serve it to our maid since none of us liked the smell of the yeast and we wouldn’t go anywhere near it.Then one day,she made some yummy Potato stew and such delicious looking lacy appams and they smelt wonderful too,with none of that funny smelling yeast and I was eager to know what the magic was. Adding Eno fruit salt to a simple rice and coconut batter did the trick.We were instant appam converts!I have been following the same recipe too and it has never failed me. Soak the raw rice for 4-6 hours. Grind to a smooth batter adding the cooked rice and grated coconut and enough water. Next morning add sugar and mix well,add more water if the batter is too thick-it has to be of pouring consistency. Just before you start making the appam,add eno fruit salt to the batter. The batter will froth up instantly,mix gently. Heat a non stick appa chatti[appam pan] or any non stick kadai. Pour a ladleful of batter into the pan when it is hot and swirl the pan in a clockwise motion spreading the batter to the sides of the pan. Swirling the pan gives the appam the customary pretty lace edges and a spongy centre. Close the lid and cook on medium heat for about 2-3 minutes. 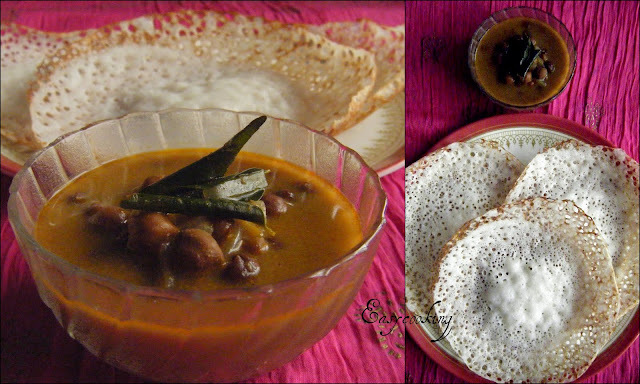 Remove the appam to a plate and serve hot with Stew,Mutta roast,Kadala curry or just sweetened coconut milk. 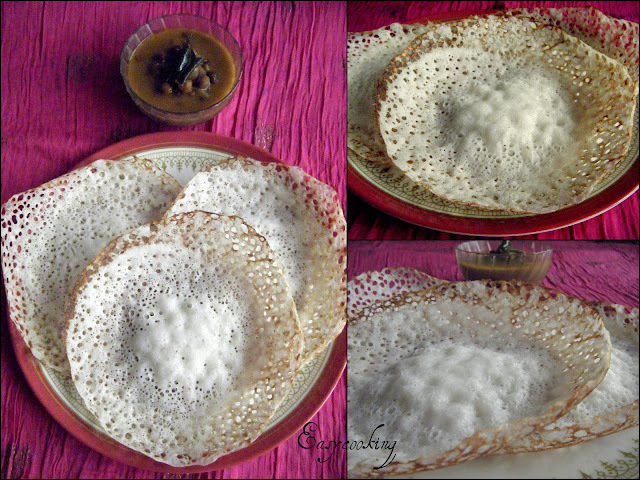 Yummy and delicious appam.. looks perfect..
i wanted to try this ..oh the yeast doesn't work well? ...eno seems to be a good option.. They look absloutley lacey and delcious. My sis make exaclty like this too. I have never made apooms at home. "kallu" is the secret ingredient Div! My mom tells that is what make the appam taste unique! They are lacy and spongy on the middle! Lovely pics dear. I have to eat it sometime as I have seen them a lot but never ate it. Appam looks very nice and yummy.Instant appam sounds interesting. That appam looks beautiful wahetever it is:)...Then regarding your comment on the icing, i frosted it thick and probably my son (and myself) kept on eating it, it was just perfect. I wish i had a bit more to finish the top....u see that messy swirls i put on top? :).coulnt complete as i expected......I think even if we dont eat, there would just be a bit extra not more if we are elaborating on deoration....I made half the quantity right...may be it will be too much when i double the recipe?Thank for poiting out...when i double teh cake, i will reduce teh quantity. These are making me hungry.. have you ever tried the double horse easy pallappam podi? It is so easy with that one and is almost similar tasting.. now I just use that one. Amma made it the conventional way, but after she discovered this podi she converted me too..haha..
Beautiful appams, i do the same way too, not a traditional appams as u told..looks great..
Co-incidentally I looking for a good and easy Appam recipe all over the net and Bingo! Thanks, will try out soon and let you know. yummy combo...looks fantastic and making me drool with ur clicks. Appams looks good enough to wear, lace and all:-)) Got to try this version of urs for sure!! Thanks for sharing about eno, makes it a lot easier..will try it out next time. Slurp!! Love Aapams. Yeah, where do I get Kallu here anyway? I make these nontraditional way too. Looks perfect. Good to be back too although I have to go thru' every blog sniffling!! Haha!! 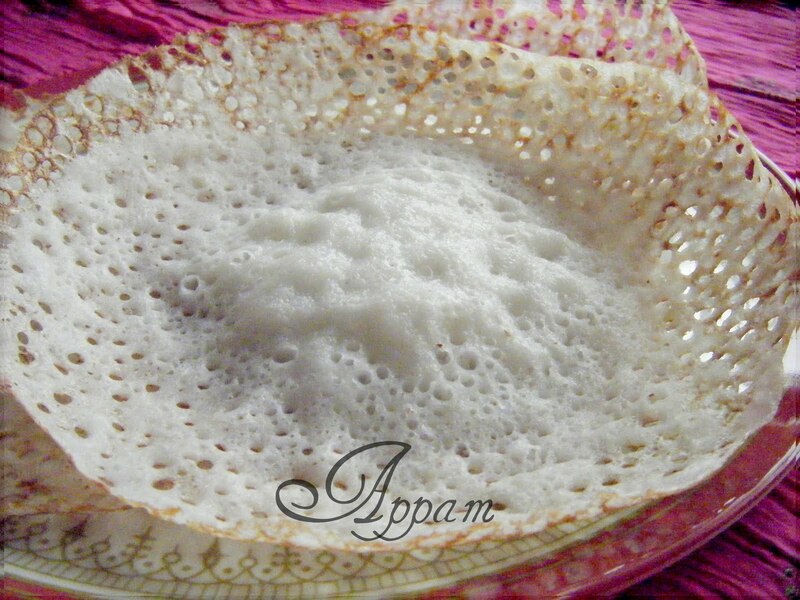 Appam looks so perfect. Bookmarked for trying this next time. I last ate appams at Amma's place in Madras last May! I'm tempted to try... but I need an appachatti! I want the apooms first of all. Beautifully lacey looking. I have never made anything with this legume, should buy them. Eno Fruit salt is an acidity relieving powder(? )which you mix with water and drink.Works best with this recipe! I love Appams but never tried on my own. Shall try it sometime soon. Hi, what sort of rice did you use? I use regular raw rice. Hello Divya!I m gonna try this....so much simple....do I really have to try adding cooked rice? Can I skip it? this is truly a lovely blog. Cant believe you can get supplies in ernakulam.thank for the ernakulam store update. Awesome work. Hey Smitha,adding cooked rice gives a nice texture to the appam,but sometimes I don't have enough cooked rice for the batter and this is what I do-cook 1/4 cup of rava in about 2 cups of water till it gets cooked-thick and porridge like.Cool it and then add it to the ground batter.Rest everything the same. Glad to share info about the baking store-happy baking! can you please tel me eno fruit salt in spoon measure?? Hi divya can you tell rice name so it will ease me.